Soundwalk Collective - What We Leave Behind From Jean Luc Godard Archives. Vinyl LP. Bleep. Audio-visual artists Soundwalk Collective were granted exclusive access to the personal archive of the groundbreaking filmmaker and present their ambitious New Album and Remix EP: What We Leave Behind released on 18th & 25th May 2018. The NYC and Berlin based group were invited to aurally explore the archive of the seminal French director Jean-Luc Godard and release their interpretations in an innovative new album What We Leave Behind. Drawing on Godard’s personal collection of shot film, reel- to-reels and historical ephemera, the recordings reveal the moments before and after the camera rolls, from stage directions and on-set asides to rehearsals, false stars and outtakes. Revealing much insight to the director’s process and personality, the 6-track album will be followed by a remix EP, featuring unique reworks from Ricardo Villalobos, Jan Jelinek and Petre Inspirescu. What We Leave Behind, and the subsequent remix EP, arrive 50 years to the day that the the Cannes Film Festival, 1968, was closed after Jean-Luc Godard, Francois Truffaut and Claude Lelouche, publicly announced their closing of the festival in solidarity with workers and students protesting across the country. 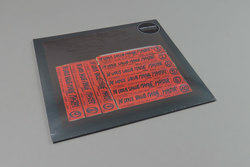 The LP features a conversation between Stephan Crasneanscki, of Soundwalk Collective, and François Musy, Jean-Luc Godard’s sound engineer, printed on a translucent paper insert. The LP and Remix EP both contain imagery taken by Stephan Crasneanscki of the archives, which he has also filmed to create a series of mesmeric short music videos of original and remix tracks.